Gateshead is a town in Tyne and Wear, England, on the southern bank of the River Tyne opposite Newcastle upon Tyne. Gateshead and Newcastle are joined by seven bridges across the Tyne, including the Gateshead Millennium Bridge. The town is known for its architecture, including the Sage Gateshead, the Angel of the North and the Baltic Centre for Contemporary Art. 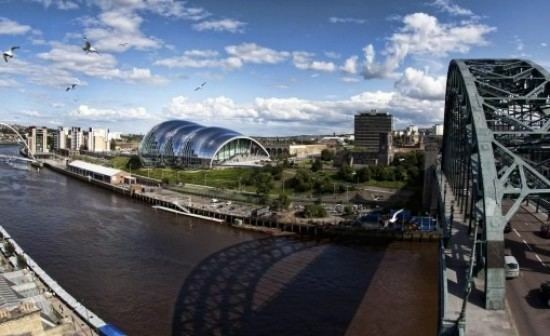 Residents of Gateshead, like the rest of Tyneside, are referred to as Geordies. Gateshead's population in 2011 was 120,046. 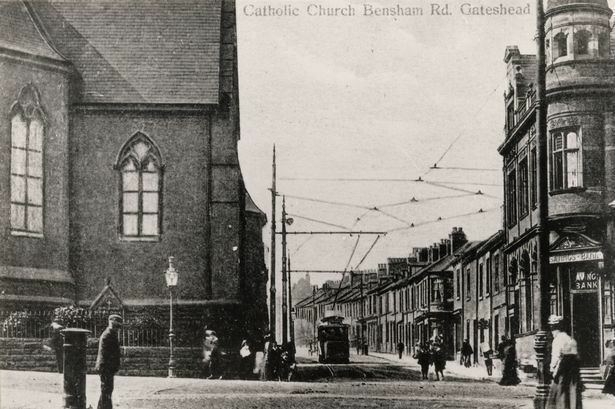 Formerly in County Durham, in 1835 the town became part of Gateshead County Borough. After the Local Government Act 1972, in 1974 Gateshead became part of the Metropolitan Borough of Gateshead and Tyne and Wear Metropolitan County. Gateshead is first mentioned in Latin translation in Bede's Ecclesiastical History of the English People as ad caput caprae 'at the goat's head'. This interpretation is consistent with the later English attestations of the name, among them Gatesheued (c. 1190), literally 'goat's head' but in the context of a place-name meaning 'headland or hill frequented by (wild) goats'. Although other derivations have been mooted, it is this that is given by the standard authorities. Robert Stirling Newall took out a patent on the manufacture of wire ropes in 1840 and in partnership with Messrs. Liddell and Gordon, set up his headquarters at Gateshead. A worldwide industry of wire-drawing resulted. The submarine telegraph cable received its definitive form through Newall's initiative, involving the use of gutta percha surrounded by strong wires. The first successful Dover-Calais cable on 25 September 1851, was made in Newall's works. In 1853, he invented the brake-drum and cone for laying cable in deep seas. Half of the first Atlantic cable was manufactured in Gateshead. Newall was interested in astronomy, and his giant 25-inch (640 mm) telescope was set up in the garden at Ferndene, his Gateshead residence in 1871. In 1835, Gateshead was established as a municipal borough and in 1889 it was made a county borough, independent from Durham County Council. In the same year, however, one of the largest employers, Hawks, Crawshay and Company, closed down and unemployment has since been a burden. Up to the Second World War there were repeated newspaper reports of the unemployed sending deputations to the council to provide work. The depression years of the 1920s, and 1930s created even more joblessness and the Team Valley Trading Estate was built in the mid-1930s to alleviate the situation. Given the proximity of Gateshead to Newcastle, just south of the River Tyne from the city centre, it is sometimes referred to as being a part of Newcastle, however Gateshead Council and Newcastle City Council teamed up in 2000 to create a unified marketing brand name, NewcastleGateshead, to better promote the whole of the Tyneside conurbation. Here is a table comparing Gateshead with the wider Metropolitan borough. The town's population in 2011 was 120,046 compared with 78,403 in 2001.This because of not only a slight population increase but also boundary and methodology changes since 2001. 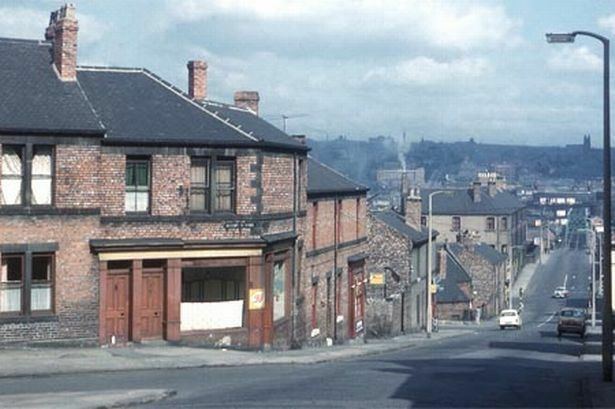 Felling used to be a separate urban subdivision and had a population of around 35,000, but now it is considered part of Gateshead town. The population of the 2011 census boundaries in 2001 was 113,220, proving that there was some sort of population increase. Gateshead is the home of the MetroCentre, a large shopping centre. The Team Valley Trading Estate, initially the largest and still one of the larger purpose-built commercial estates in the United Kingdom, is in Gateshead. Gateshead International Stadium regularly holds international athletics meetings over the summer months. It is also host to rugby league fixtures, and the home ground of Gateshead Football Club. Gateshead Thunder Rugby League Football Club played at Gateshead International Stadium until its purchase by Newcastle Rugby Limited and the subsequent rebranding as Newcastle Thunder. Both clubs have had their problems: Gateshead F.C. were controversially elected out of the Football League to make way for Peterborough United in the 1960s, whilst Gateshead Thunder lost their place in Super League as a result of a takeover (officially termed a merger) by Hull F.C. Both Gateshead clubs continue to ply their trade at lower levels in their respective sports, thanks mainly to the efforts of their supporters. The Gateshead Senators American Football team also use the International Stadium, as well as this it was used in the 2006 Northern Conference champions in the British American Football League. Gateshead Miners are Gateshead's first and only Aussie Rules Football team and compete in the Aussie Rules UK National League. Tyne and Wear Metro stations at Gateshead Interchange and Gateshead Stadium provide direct light-rail access to Newcastle Central Station, Newcastle International Airport, Sunderland, Tynemouth and South Shields. Gateshead Interchange is the busiest bus station in Tyne and Wear and was used by 3.9 million bus passengers in 2008. National Rail services are provided by Northern at Dunston and MetroCentre stations. The East Coast Main Line, which runs from London to Edinburgh, cuts directly through the town on its way between Newcastle Central and Chester-le-Street stations. There are presently no stations on this line within Gateshead, as Low Fell, Bensham and Gateshead West stations were closed in 1952, 1954 and 1965 respectively. Gateshead is served by the following rail transport stations with some being operated by National Rail and some being Tyne and Wear Metro stations. The Bensham district is home to a community of hundreds of Jewish families and used to be known as "Little Jerusalem". Within the community is the Gateshead Yeshiva, founded in 1929, and other Jewish educational institutions with international enrollments, such as Sunderland Yeshiva, Yeshiva Ketana, Beer Hatorah, Nezer Hatorah, Sunderland Kibutz and Yeshiva Gedola.